I’d never really contemplated the idea that having a child would involve panels and social workers, rather than antenatal class, midwives, etc. Life however is in the habit of ignoring my assumptions, turning any preconceptions on their head, and long story short here we are embarking on quite a different path to what I expected: the path of adoption. And for me at least, the first big step – the moment that made it all seem real – was the the Little City information evening hand-stitched mum and I were invited to. I would normally be pretty nervous attending an event like this, but somehow the timing seemed right. We had previously attended an information evening by Rural, however I felt like an observer that night. I was dipping my toe in the bath to check the temperature before taking the plunge. At Little City’s evening I felt like I was actually there for a reason. The event was held in a small room at their offices, which felt intimate, unassuming and welcoming. Hand-stitched mum and I made our way in, sat a couple of rows back from the front (not wanting to seem too eager or not eager enough) and chatted while waiting for others to arrive. All in all there were probably about eight other couples there by the time things got started. First up was the team lead who introduced herself and talked a little about the history of adoption and the adoption process as it is now. To be honest, many of the details washed over me a little during the first part of the night. Most of the stuff they said, hand-stitched mum had already told me.† Also I was trying to be mindful of my feelings – something that doesn’t always come naturally to me. 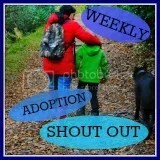 Next up was an adoptive parent who talked us though their adoption process. For me, it was reassuring to hear someone talking passionately about their experiences. At the information evening for the Rural adoption agency last year, one of the adoptive parents who spoke was clearly stressed and very upset. It was scary to see such strong emotions. As I hadn’t heard from an adoptive parent before that night, I started to wonder if that’s just how adoption is! At the Little City information evening it was nice to be reminded of the positives too. Lastly, a social worker introduced herself and described her part in the adoption process. She was warm and friendly, with a genuine smile. I knew it was unlikely that she would be our social worker. The whole process of inviting someone into our house and our lives seems very alien to me, so it was just nice to put a friendly human face to the adoption agencies. Questions were invited at the end, as you tend to expect not many people were brave enough. However, many stayed on at the end to speak to the social workers and adoptive parent more privately. Hand-stitched mum and I stayed too and we asked the social worker whether it was okay to start to the process while considering a house move. Thankfully, the social worker said it was fine, as long as it was completed before we adopted. As we drove home, hand-stitched mum and I chatted. I remember being excited. I could hear the excitement in my own voice and it felt good. In fact, it felt very good to be embarking on a path that I’d never anticipated being on. †Hand-stitched mum has an unbelievable ability to research, absorb and recall information!